Cretaceous Dinosaur Fossil Sites in the Mongolian Gobi is part of the Tentative list of Mongolia in order to qualify for inclusion in the World Heritage List. I began my trip in Ulaanbaatar, where I stayed at the Ulaanbaatar Hotel, opened in 1961 and the city's oldest hotel (www.ubhotel.mn/), and ate hot pot at The Bull and the foreign version of Mongolian barbecue at bd's Mongolian Grill, opened in 2005 and the first U.S.-based restaurant to open a franchise in Mongolia (www.gomongo.com). I spent a day visiting the city's very few sites, including the Gandantegchinlen Monastery, but the best experiences in Mongolia are outside its capital. I flew to Dalanzadgad, the gateway to the Gobi desert, where I stayed at the Three Camel Lodge (www.threecamellodge.com/), and visited Yolyn Am gorge and Bayanzag (also known as the Flaming Cliffs). 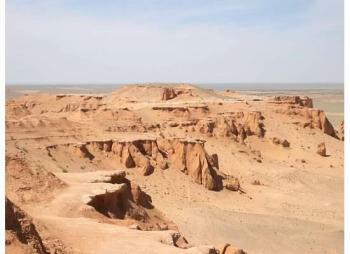 Bayanzag, where Roy Chapman Andrews made several important discoveries of dinosaur fossils, including the first discovery of dinosaur eggs, in the 1920s, is on the tentative list of UNESCO World Heritage Sites as one of the Cretaceous Dinosaur Fossil Sites in the Mongolian Gobi.